Movie Review: The Wrecking Crew! 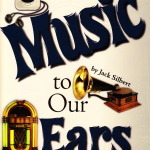 Music to Our Ears, a book I wrote for the Heinemann Leveled Literacy Intervention program, was just published. It’s a history of enjoying music, from 19th-century sheet music to modern streaming services.